In her debut collection, Ruthig records the ebb and flow of individual life through time, landscape, and this collective existence. How we connect with the past, where we are now, and our personal convergences, despite our inherent separateness, are all part of the journey. Ruthig also explores the need to create, to build a deeper sense of self, of belonging: questioning, observing, then striving to respond. Her voice is confident, concentrated, wry. This is a book of poems about the dynamic of being, and our shifting perception of who we are from one moment to the next. Read the opening poem, “Ten Mile Point” and another, titled “Doorway“. Fitzhenry & Whiteside. 2016. ISBN-13: 9781554554027. | Press release. | Book a reading. | Read an interview (June 2017). | Listen to a discussion and reading from the book (broadcast on Northumberland 89.7FM radio in April, 2016) and from September, 2016, the “Howl” CIUT 89.5FM radio interview. 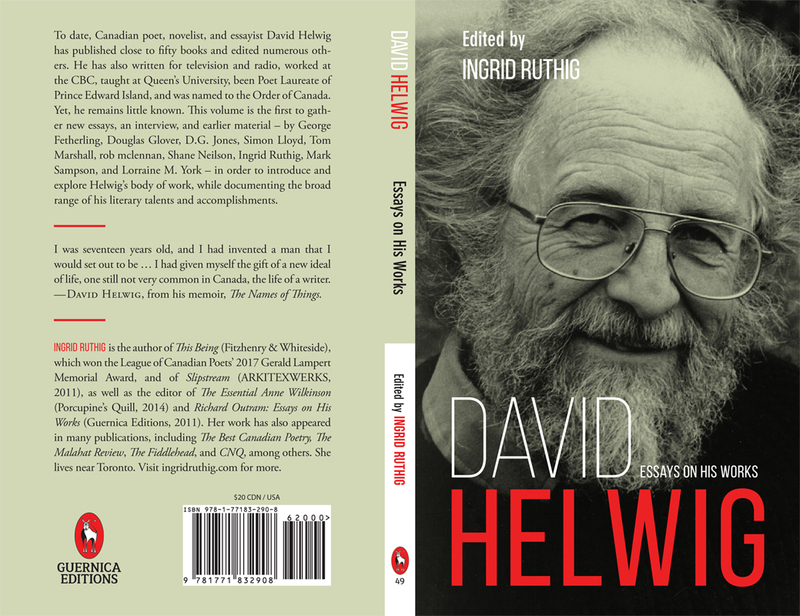 During his long career, Canadian poet, novelist, and essayist David Gordon Helwig (1938-2018) published close to fifty books and edited numerous others. He also wrote for television, worked at the CBC, taught at Queen’s University, was Poet Laureate of Prince Edward Island, and received the Order of Canada. Yet, his name remains little known outside the literary world. This volume is the first to gather together new essays, an interview, a bibliography and brief biography, and revisits past reviews to explore the extensive range of Helwig’s talents and accomplishments, and to introduce his written body of work, with contributions from Douglas Glover, Simon Lloyd, Shane Neilson, Mark Sampson, Lorraine York, rob mclennan, George Fetherling, D.G. Jones, Tom Marshall, along with an introduction and essay from Ingrid Ruthig (editor). Guernica Editions. 2018. Essential Writers series, Volume #49. ISBN 13: 9781771832908, ISBN 10: 1771832908 (trade paperback); ISBN: 9781771832915 (epub); ISBN: 9781771832922 (Kindle). | Press release. | Purchase from Guernica Editions, independent bookstores, or from Chapters.Indigo.ca. | Tributes to David Helwig in The Guardian, CBC, and the Globe and Mail. | Ingrid’s tribute/remembrance of Helwig’s last public reading in Charlottetown PEI. Anne Wilkinson’s poetic career emerged during a time of few Canadian poets—and even fewer who were women. The Essential Anne Wilkinson showcases the work of her abbreviated but meaningful career, with poems that range from intellectual and symbolic lyrics, to direct, incisive satire… [and] gives voice to a highly regarded but oft-forgotten poet, who introduced a unique female perspective to the Canadian modernist movement. The poems in this volume, #11 in the Essential Poets Series from Porcupine’s Quill, are selected and introduced by Ingrid Ruthig (editor), and include a bibliography and brief biography. Porcupine’s Quill. 2014. Essential Poets Series Volume 11. ISBN-13: 9780889843769. | Preview. | Learn more about Wilkinson’s work from A.J.M. Smith and Robert Lecker. | Ingrid’s “At the Desk” feature on Open Book Toronto, and her presentation of Wilkinson on Brick Books’ Celebration of Canadian Poetry. | Anne Wilkinson reading on the album “Six Toronto Poets”. | Ingrid and other Essential Poets editors Amanda Jernigan and Shane Neilson discuss the series on “ArtWaves” with Bernadette Rule. | Teachers, visit the PQL website for “Unpacking Poetry: Exploring the Essential Poets Series” instructor resources. Slipstream is a poem sequence and artist’s bookwork, which was commissioned by the Visual Arts Centre of Clarington. Rough notes Ingrid once intended for a larger narrative were instead, over several years, distilled into a sequence of twenty short, linked poems. First presented as a textwork of twenty panels fusing Ingrid’s words and images, Slipstream was re-imagined for book form. It was produced in two limited, handmade editions, and launched in conjunction with an exhibition of the original artwork at the VAC. ARKITEXWERKS. 2011. Limited to 100 handmade copies, in two editions — 25 deluxe (white, numbered, SOLD OUT) & 75 standard (red). | Click cover images for more information and a glance inside the book. Purchase from the author (click red button) or at Toronto’s Knife|Fork|Book poetry bookstore. From the dictionary: synesthete: a person who experiences synesthesia. synesthesia (n.) 1. A condition in which one type of stimulation evokes the sensation of another, as when the hearing of a sound produces the visualization of a color. 2. A sensation felt in one part of the body as a result of stimulus applied to another, as in referred pain. 3. The description of one kind of sense impression by using words that normally describe another. This volume is from the series of small chapbooks produced by LittlefishcartPress, featuring the work of Canadian poets: Leigh Kotsilidis, Gabe Foreman, Jeramy Dodds, Josh Trotter, Steven Laird, Cameron Esler, Zachariah Wells, Alex Boyd, and others. Littlefishcart Press. Limited edition ‘Chipbook’ series. Poet Richard Outram, who died in January, 2005, has been quietly lauded as a major figure in twentieth-century English-Canadian literature. Yet in his lifetime, despite international attention, he received only minor recognition from Canada’s literary establishment. This volume presents the first posthumous panorama of Outram’s work and achievement. Edited by Ingrid Ruthig, it includes an interview, a lecture, an elegy, and new essays by poets and writers who admire Outram’s commitment to “concision and precision” in language — Brian Bartlett, Michael Carbert, Robert Denham, Jeffery Donaldson, Steven Heighton, Amanda Jernigan, Eric Ormsby, Peter Sanger, and Zachariah Wells, with an introduction, essay, bibliography and brief biography by Ingrid Ruthig (editor). Guernica Editions. 2011. Essential Writers series, Volume #28. ISBN13: 9781550712803, ISBN10: 1550712802 (trade paperback). | Preview. | Read about Outram’s Port Hope, Ontario home in Literary Landmark, an article for Open Book Ontario (archived). “This critical series deliberately selects for coverage poets who are not the darlings of prize culture. … Think of how we conceive of ourselves on curriculum vitae, as a series of discrete accomplishments. I am this. I am that. Now make identity not a thing, not a compendium, but a process. This is what Clifford’s poetry can give you.” — Shane Neilson, Editor. With new essays by M. Travis Lane, Jeffery Donaldson, Ingrid Ruthig, and Shane Neilson. Frog Hollow Press. 2018. Literary Criticism Monograph #6. 100 numbered copies. ISBN: 9781926948614 (trade paperback). These are some of the ideas driving the poems of Ted Landrum, Komi, Olaf, and Ingrid Ruthig, three architecture-trained poets who, despite different poetic styles, find common ground in their architectural training, their views about creating art, and their individual approaches to writing poetry. Published in the fall of 2018, this chapbook was released on November 2, to mark the occasion of the poets coming together in Toronto, Ontario for “Room to Room: Poetry & Architecture in Conversation”, an evening of readings and animated discussion held at Knife|Fork|Book poetry bookstore in Kensington Market. The volume includes poems and commentary, on the relationship between poetry and architecture by all three contributors. ARKITEXWERKS. 2018. 4 1/2″w x 11″h. This limited-edition book is printed with archival pigment inks on 28 lb. acid-free archival Mohawk Superfine Eggshell paper, wrapped in 100% rag vellum end papers and a cover of Strathmore 300 watercolour paper, then hand-sewn with waxed linen thread. 16 pp. 100 numbered & signed copies. Purchase at Knife|Fork|Book poetry bookstore in Toronto, or click the link below to connect & order directly from ARKITEXWERKS.